'A huge well done and massive thank you to Reays who have raised a whopping £6,276 for the hospice last year! 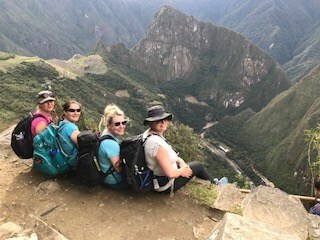 An extra special mention to Nicola Reay and Fiona Ismay who took part in a Maccu Picchu trek raising an incredible £4,657.06! WOW! Last year thousands of people joined the hospice at their first Memorial Event at Talkin Tarn. They hope you can join them this year. During this special evening the tranquil setting of Talkin Tarn will be transformed by hundreds of lights on the lake and in the surrounding woodland. Each light represents a cherished memory of a relative, friend or loved one no longer with us. The symbolic event provides you with the opportunity to reflect and remember in a peaceful setting. Each light can be personalised with a special message before being placed on the floating platform. Sunday 22nd October 2017 at 5pm. From 5pm you have the opportunity to give the organisers your light ready to go on the tarn. To get your lantern for the evnt please complete an event leaflet or visit the event page on www.edenvalleyhospice.org. Alternativley you can collect it from the Hospice or one of their shops before the event. Reays will be providing two 70-seater coaches free of charge to transport passengers to and from the Tarn, on a park and ride basis. Passengers will be able to leave their cars at William Howard School in Brampton or Eddie Stobart Distribution centre at Carlisle Airport. Park and ride buses will run from 4pm until just after 5pm, then again from 6:30pm. Refreshments for the evening will be available from the Tea Room at Talkin Tarn and Brampton Golf Club. "We are pleased to support this event for the second year running, providing these coaches free of charge means that people can leave their cars elsewhere as there is a limited amount of parking space at the Tarn. As Eden Valley Hospice are Reays charity of the year, this charity holds a special place in our heart, so anything we can do for them, we try to." Said Commercial Director Michelle Stacey. If you would like to attend the event contact Eden Valley Hospice. A group of 20 walked Derwent Water, Saturday 10th June 2017, to raise money for Amy. Amy is an 18-year-old girl who was diagnosed with acute myeloid leukaemia, a cancer of the blood and bone marrow. The majority of the walkers work in the Sellafield Training Department and Amy is the daughter of one of their colleagues, who has sadly been diagnosed with the horrible disease. When Heidi contacted Reays regarding the supply of a mini bus to transport the walkers to and from the destination, Nicola Reay, the Finance Director, agreed immediately. Reays provided a 22-seater mini bus to take the group of walkers from Egremont to Derwent Water Hotel. Michelle Stacey, Commercial Director at Reays, said: "This is a fantastic cause to support. Amy's story is heart-breaking, for an 18-year-old to have to go through this, she must have a very strong character." Fundraisers trek Ben Nevis in aid of three West Cumbrian Charities. Reays provided an 8-seater min-bus and a driver to take the group to Fort William. "We would like to say a huge big thank you to Reays for coming forward and supporting us with a mini bus. It means that we can give more money to our chosen charities and that we could all travel together as we headed off for our challenge. The staff have been amazing. 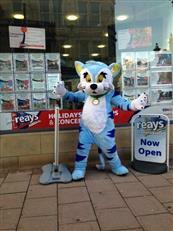 Thank you to everyone involved at Reays head office. The trek took place the weekend of 25th/26th September 2017. 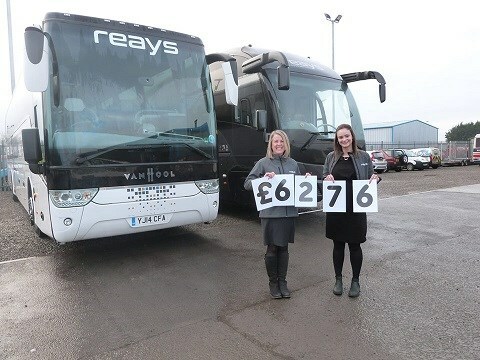 Rosie Groves, marketing and sales assistant at Reays, said: "We are a family-run company very much involved in the West Cumbrian community, so we are delighted to be able to help by providing free transport. "I understand that it would have cost them up to £800 and that sum of money would have had to have come out of our fund-raising total." Egremont Crab Fair celebrates its 750th anniversary next weekend - and Reays will be providing free transport to ferry spectators to and from the heart of all the action throughout its main day. We'll be running a complimentary return shuttle service from 1-5pm on Saturday September 16 between the town's war memorial and the fair field at Baybarrow Road. Two special buses will operate throughout crab fair day, dropping people off and taking them back to the town centre. It's free for passengers and it won't cost event organisers a penny either. 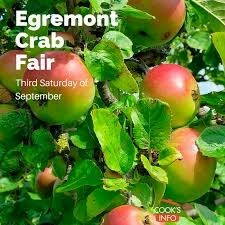 "The Egremont Crab Fair is world famous and as this year is such a special date for it, we will be providing the free bus service without any charge to the organisers," said Michelle Stacey, Reays commercial director. "They run the crab fair every year on an entirely voluntary basis and we wanted to help them as we are every much involved in the community in Egremont where we have a depot," she added. Saturday's attractions include the Gurning World Championships, apple cart parade and crab fest, featuring fairground rides, children's entertainers and a stunt team. The crab fair starts on Friday evening with a Dancing In The Streets concert in Main Street starring Union J, Sonia and Stooshe. It was first established in 1267, making it one of the oldest fairs in the world. Our sister company, Glenrental, has come to the rescue of a team of four charity cyclists who are riding from Land's End to John O'Groats on a double mercy mission. The riders, are making the 948-mile trek in aid of Macmillan Cancer Support and to raise money for local teenager Michael Johnstone, who had a leg amputated below the knee after being hit by a car in the city in January. 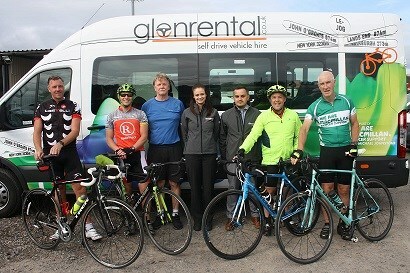 The cyclists, acknowledge that the nine-day ride would not have been possible without the sponsorship of Glenrental. The car and van rental business has loaned them a minibus free of charge complete with their own personalised livery to act as support vehicle along the route and get them to the start and back home again. "We are just pleased to have been able to help them achieve their goal of cycling from Land's End to John O'Groats to raise money for two such worthy causes," said Ryan Williamson, manager at Glenrental. Sponsor the cyclists via Just Giving. Reays were delighted to be able to support the recently-formed Salterbeck FC and their young footballers last season. It was our pleasure to take the well-behaved youngsters from Workington to one of their away fixtures on one of our coaches. In fact, they were such good company that we arranged a surprise for them to travel to a game at Carlisle United - making the journey from west Cumbria to Brunton Park and back in celebrity style aboard a luxury coach used by Premier League stars. "You should have seen their faces when we arrived to pick them up with the official Burnley FC coach," said our commercial director Michelle Stacey. "They absolutely loved it and were so excited, especially the tables and big leather seats with all mod cons," she added. The Clarets, who include England internationals Tom Heaton and Michael Keane, travelled to all their away fixtures last season aboard the same top-of-the-range Reays coach. And they will be using it again this coming season, just like Salterbeck FC did! Michelle Stacey and Rosie Groves, our sales and marketing assistant, were invited by club manager Martyn Rossi to attend Salterbeck FC's first ever end-of-season presentation night earlier this month. Michelle is seen being presented with a framed Salterbeck FC shirt by Martyn. "It was great. I'd like to do it again!" That's what our senior accounts technician Kate Sparkes-McSevich said after abseiling down the tallest building in Carlisle yesterday to raise money for Reays 2017 charity of the year - the Eden Valley Hospice. Dare Devil Kate, 24, took just two minutes to safely negotiate the 44 metres drop from the top of the 10-storey Civic Centre, raising £621 so far through sponsorship during the Royal Oak Scotby Charity Abseil. She added: "The view from the top was amazing. I could see the whole city but I started to feel a bit dizzy the longer I stood there thinking about it. I just wanted to get it over and done with. "I just tipped back and kept my legs straight. It actually felt like I was bouncing down the building. I could hear my grandma shouting 'come on Kate' but I was definitely not looking down!" Huge congratulations to our finance director and co-owner Nicola Reay, who has safely completed her trip-of-a-lifetime charity trek to the lost world of Machu Picchu high up in the Andes in Peru. Nicola, accompanied by her sister Fiona Ismay, sent back this message after reaching her remote mountain destination, having raised £3,385.81 in sponsorship so far for Eden Valley Hospice, Reays' charity of the year. "After 4 days of trekking the Inka trail, through tropical rain forests, mountain passes over 4,000m with the most beautiful scenery along the way, we finally arrived at Machu Picchu from the Sungate entrance. One of the most amazing experiences of our lives! Thank you so much to everyone who has donated. We are very, very grateful." Nicola and Fiona paid for the trip themselves and completed it in memory of their late mum Fay who was cared for at the hospice. Well done girls. Have a safe trip home. You can still sponsor them at www.justgiving.com/fundraising/Reays-Coaches . Reays provided a 29 seater for the ICT 2017 Badminton Team Cumbria, this transported them to and from the 2017 Inter Counties Tournament for the full weekend. Our Driver, Chris Bowness, kindly drove the bus for free. We received the following thank you from Andy Lovatt, a member of the Cumbria Badminton Association. 'Just a note to thank you to Reays for the use of the coach during the U18 ICT Badminton tournament during Easter. The team was the envy of many other counties with their "posh" coach as they called it. The journey to and from the event is as much a part of the week as the actual tournament, for the team to travel together only enhances team spirit and the young players make friends for life. Once again a great big thank you from the team and Cumbria Badminton association it really did put the icing on a great week. The association have kindly decided to donate £100 to our JustGiving page to say thank you for all Reays' help. Above is the ICT 2017 Badminton team with our driver Chris Bowness. 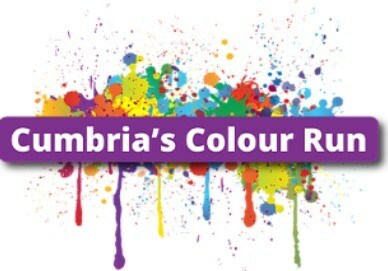 A team of eight from Reays will be taking part in the Carlisle Colour Run on Sunday May 14 to raise money for our 2017 charity of the year - the Eden Valley Hospice. Our volunteers are seeking sponsorship after agreeing to enter the annual five-kilometre family fun event which involves hundreds of people of all ages running or walking two laps of the track at Carlisle Racecourse. Besides being spattered with powdered paint in all sorts of colours, participants this year for the first time will also pass through a foam and bubbles station to add to the spectacle. "We are really looking forward to it, " said Team Reays leader Rosie Groves, our marketing and sales assistant at Wigton HQ. "I'm not sure what we will look like covered in paint, foam and bubbles but it's all in a very good cause," added Rosie, who will be joined on the run by her nephew Thomas. Also taking part are commercial director Michelle Stacey and her daughter Savannah, along with our Carlisle travel centre manager Rachel and her nephew Oscar, accounts technician Becky and operations support Jenna. The hospice is just a short distance further along Durdar Road from the racecourse. The event, now in its third year, starts at 1pm. You can sponsor Team Reays by visiting our JustGiving page. Accounts technician Kate Sparkes-McSevich has a head for figures - but has she got a head for heights? We'll find out on Sunday June 18 when daredevil Kate abseils down the Civic Centre in Carlisle to raise money for the Eden Valley Hospice - our 2017 charity of the year - and the Jigsaw Children's Hospice. Kate is part of a team of fund-raisers from the Royal Oak pub at Scotby who will be taking part in a charity abseil from the top of the tallest building in Carlisle - all 12 storeys and 145 feet of it. That's the equivalent of the height of 12 Reays coaches stacked on top of each other! "I'm told the views from the top are amazing - but I'm not sure I'll be able to enjoy them," said Kate. 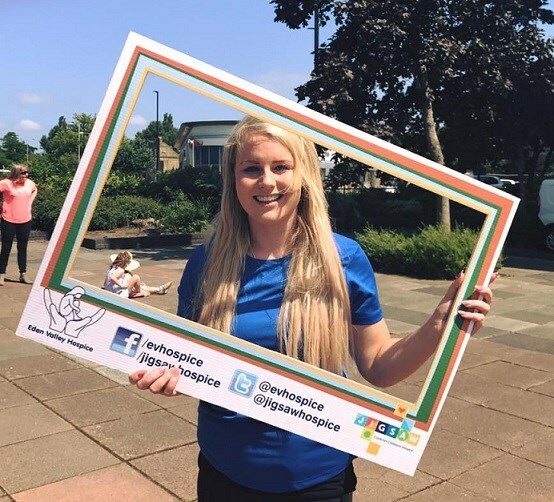 "It's all in a good cause though and a lot of people I work with at Reays have been raising money for the hospice through runs and other events, so I'm just glad to be able to do my bit,"
You can sponsor Kate by visiting the JustGiving page. Our finance director Nicola Reay is off to deepest, darkest Peru to take part in a charity trek along the Inca Trail to Machu Picchu. Nicola will be accompanied by her sister Fiona Ismay on the high-altitude hike in the Andes, which starts on May 26th. Their twin aim is to reach the ancient lost settlement of Machu Picchu while raising money for our 2017 charity of the year, the Eden Valley Hospice. "We've got absolutely no experience of international trekking," said Nicola. "We both enjoy walking in the Lake District but this trip is the absolute ultimate hike." Fiona added "It is a big tick on my bucket list and helping the charity while experiencing one of my ultimate destinations" she added. Equipped with a sleeping bag each, they'll be camping in sub-zero temperatures while trekking nearly 30 miles over four days at altitude through sub-tropical jungle and cloud forest, climbing to around 4,000 metres. That's three times higher than Ben Nevis! Their guides will also ask them to hand over their mobile phones as part of a "digital detox." Nicola said: "Our mum was cared for at the hospice, so we know first-hand what great work they do and how much they need the money." You can sponsor Nicola and Fiona by visiting the Just Giving page. Reays provided a 70-seat coach free of charge to transport people to a charity event in aid of Eden Valley Hospice at Aspatria Rugby Club. And we are delighted to report that the evening event, organised by Neil Edmondson in memory of his mother, raised the fantastic total of £1,737. Neil said: "It was a brilliant night - really, really good - and I'm so thankful to Reays for helping to get everyone to the fund-raiser and taking them home to Carlisle and Wigton. It is very much appreciated. "All the money we raised has been banked and we will be taking a cheque to the hospital very soon." The funds were boosted by the Reays driver who drove the coach that evening very generously donating his wages from that job to Eden Valley Hospice, which is our charity of the year for 2017. 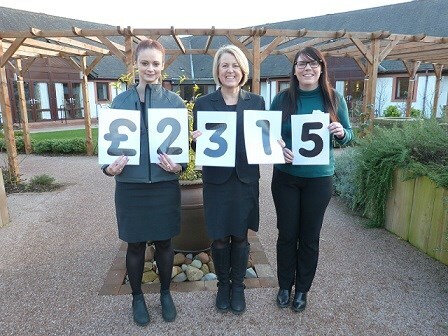 Michelle (our Commercial Director) and Rosie (our Marketing Assistant) visited Eden Valley Hospice to donate the money Reays have raised throughout 2016. We have raised an amazing £2315! We are proud to say Eden Valley Hospice will remain our charity of the year for 2017, we aim to raise as much money as we can through various charity events as well as helping the charity with transport and raffle prizes. At the end of January we teamed up with Carlisle United in order to send 20 children from Salterbeck FC to play a match on the pitch before watching a football game. The children were surprised when we picked them up in one of our VIP coaches. 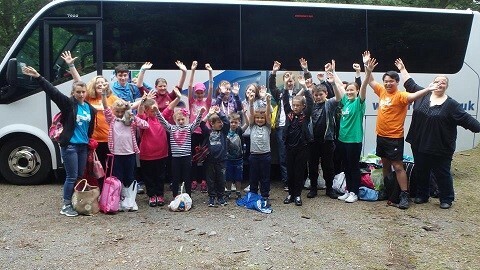 Reays was happy to provide free transport to enable a group of youngsters to enjoy a day out at the Rock UK outdoor adventure centre near Newcastleton. The VIP passengers who made the trip to Whithaugh Park in the Scottish Borders all have brothers or sisters who are being cared for at the Jigsaw Children's Hospice in Carlisle. "They had a fantastic time and sent us a picture with their coach in the background," said Reays commercial director Michelle Stacey. "I'm glad we were able to help them have a fun trip," she added. The children's hospice is based on the same site in Durdar Road as the Eden Valley Hospice for adults, which is Reays' charity of the year for 2016. Next year will be the 10th anniversary of Jigsaw Children's Hospice. Natalie Bingham, from Eden Valley Hospice, said: "We organise an away day once a year just for the siblings of the poorly children at Jigsaw. It went really well. Everyone was raving about it. It was really good of Reays to take care of the transport and provide a vehicle for us." Reays staff will be supporting our 2016 charity of the year - the Eden Valley Hospice - by taking part in two fund-raising runs next month. 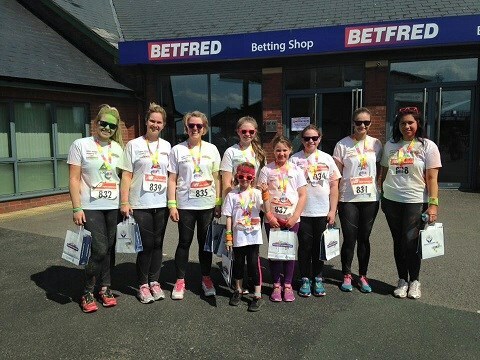 An all-female team of five who work at Wigton or Carlisle is to take part in the Cumbria Colour Run on Sunday May 8 at Carlisle Racecourse, just along the road from the hospice. Our line-up consists of commercial director Michelle Stacey, travel shop manager Rachel Lindsay, sales and marketing assistant Rosie Groves, accounts technician Becky Kirkbride and operations assistant Shakayla Okesene. Joining them in the fun family event will be Michelle's daughter Savannah, aged seven. Then on Sunday May 29, Becky and her sister Aimee will be running in the Edinburgh Marathon. Becky is already training hard for the 13-mile event and she is also busy collecting sponsorship, all of which will go towards our final total at the end of the year in support of the Eden Valley Hospice. All our runners will be wearing special Reays-branded kit at the two events, so make sure you give them a big cheer if you see them racing past! The two runs are part of a programme of fund-raising events being staged by the company and its staff throughout the year in aid of the hospice. A group of air cadets from Cumbria are ready for take-off after having their rusting old vehicle restored by bus and coach operator Reays. Youngsters from 2199 (Workington) Squadron of the Air Training Corps had been grounded at their base in Victoria Road without a roadworthy mini bus of their own. But now they will be travelling together in style, including trips for flying lessons at their parent RAF base in Yorkshire, thanks to the support of Wigton-based Reays. Qualified staff at the company's workshop and garage have transformed a badly-corroded 1999-registered mini bus the squadron had recently acquired into a gleaming safe-to-drive vehicle the cadets are all proud of. It was officially handed back to them by Chris Reay, managing director of Reays, at the company's Strawberry Fields HQ in front of Allerdale's deputy mayor Bill Bacon and deputy mayoress Valerie Bacon on Thursday evening. Warrant Officer Pete Baggley, the squadron's commanding officer, said: "We bought the mini bus fairly cheap. It was sound mechanically but the bodywork was in a bad way. So we approached Chris and he said he would support us. "The amount of work Reays have done on it is fantastic. They cut off a lot of rust, manufactured panels and put them in, repaired it, painted it and serviced it. There is no way we could have afforded to pay for all the required work. They spent three weeks on the bodywork alone. They've even liveried it up for us. We can't thank Chris and everyone at Reays enough. "We've got flying next week at RAF Leeming and we'll be taking the cadets there in their new mini bus. We used to have to hire a seven-seater car but now we can take a lot more to Leeming and to Warcop and St Bees for shooting range practice." The squadron of boys and girls aged 12-20 are planning a programme of further excursions in the revamped vehicle. 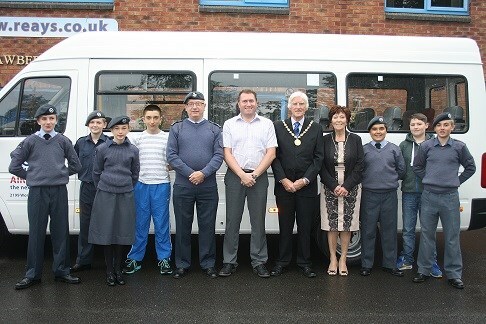 Air cadet Brenden Szeremeta, 14, said: "The mini bus is great. We can go on day trips or camping and it is a lot more fun. Getting to RAF Leeming for flying will also be easier as we won't have to spend money on renting a car or van." Chris Reay said: "The cadets are a great bunch and we were glad to be able to use our experience and expertise to help them. Safety is always the absolute priority for us at Reays and all our vehicles are modern and properly maintained. We are also a family-run Cumbrian company and extremely proud of our ties with the community all over the county." Cadets on parade in front of their new-look vehicle with Allerdale's deputy mayor Bill Bacon and deputy mayoress Valerie Bacon, Chris Reay and commanding officer WO Pete Baggley. The cadets are, from left, Owen O'Donnell, 13, Jay Williams, 12, Abbie Devlin, 13, Alan Coop, 13, Brenden Szeremeta, 14, Luke McCallig, 14, and Bailey Younghusband-Mawson, 13. The Carlisle-based hospice is very close to our hearts as several of our staff have had family members looked after at the charity-run facility, which provides specialist care for local adults and children throughout Cumbria. We have raised money for EVH in the past and are now asking you to sponsor our passengers, staff or business partners in a series of fund-raising events throughout the year. You're also welcome to have a go yourself! And if you fancy taking part yourself there's the X-Border challenge 10K being run on 31st August (an event we've been supporting for the last 3 years), with more events planned for the summer. Thank you for your support for the hospice. 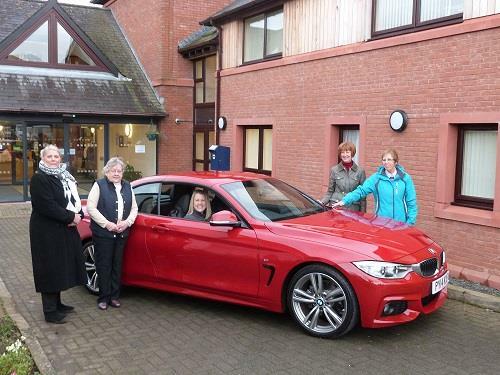 Some of the winners picking up their prizes and admiring the BMW! We had a great morning meeting all the winners of the raffle prizes. Lloyds BMW brought along a beautiful red convertible and everyone had their photo taken with it - we all wanted to take it home but sadly for us we didn't win it - but fantastic for the person that did! Well done to everyone and thank you for raising a grand total of £34,000 a great effort for a great cause. 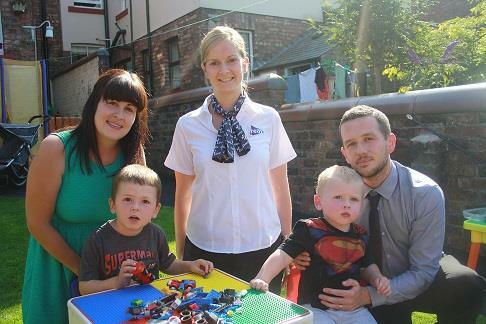 It was our pleasure to offer a family holiday to Legoland with Reays as a raffle prize at the Jigsaw Appeal family fun day at Eden Valley Hospice last month. And here are the lucky winners of the three-day luxury coach break, including visits to Dudley Zoo and Legoland at Windsor, plus a tour of London. Mum Kate Braniff, 30, and dad Adam, 30, from Carlisle, are pictured with their sons Jack, four, and Leo, two, who goes to the hospice. Presenting them with their prize is Rachel Scott, manager of our holiday and travel centre in Carlisle city centre, where you can book places on any of our UK or European holidays and trips. For further information, call 01228 267 267. 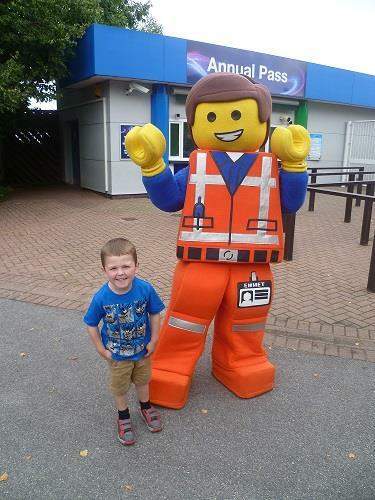 "We had such a fantastic time at Legoland as part of our three day holiday that we won as a raffle prize at the Jigsaw Family Fun Day. Our youngest son, Leo who is 3, attends Jigsaw for day care. We went on the trip with our eldest son, Jack 5, and he thoroughly enjoyed himself. We would like to thank Reays coaches for being so generous in providing such an amazing prize"
Hospuss outside our Travel Centre on Devonshire Street, Carlisle on his day out selling raffle tickets and collecting for Eden Valley Hospice. A huge thank you to everyone who donated.